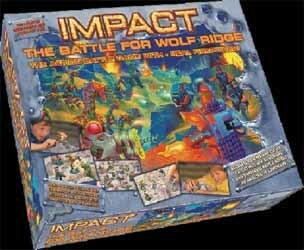 Impact: The Battle for Wolf Ridge is not only a really fun game, it's also a great looking one. The games developers have put a lot of work into ensuring that both the game board and figures are as attractive as possible. Your mission is to manoeuvre your soldiers and guns to defeat your opponent. Take them out with direct fire or use clever tactics to capture them. The battle rages across rugged 3D hills using a network of tracks that criss-cross the battlefield. The instructions are easy enough to follow and there are are three levels of play (to ensure that you don't get bored of this after the first few times you play it). You take control of 1 x large gun, 1 x medium gun and 6 x dino/human soldiers as you try to outwit your opponent. When they are within range, you can blast them with one of your guns. But be careful not to put your weapon in the line of site of your enemies guns. The only slight complaint I had (and this is more a marketing point) was that the box illustration was a little odd. It doesn't exactly convey what's inside. It actually reminded my more like an illustration from an '80s board game. Also there are pictures on the back of the box that depict the figures that you use in the game. The picture is accompanied by a caption that reads: "Figures Included (Life Size)" I had images of opening the box to discover that six-foot-tall figures leapt out at me. I think it might have been better if it had read: "Figures Included (Actual Size)". But these are small niggles (that aren't really important) when you consider what a great board game this is. 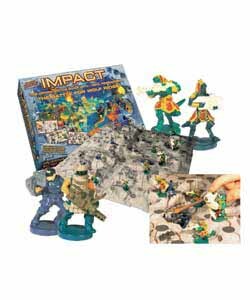 An added bonus is that not only is this a fantastic stand-alone game in it's own right, but if you already own the original Impact game, you can use this as an add on to provide a huge 10-board battlefield. It's even a game where mum and dad can team up against the kids (each playing as either the dinosaurs or humans) to ensure that all the family have fun. Just don't be surprised when the kids start taunting the adults by shout: "You're dead, you old dinosaurs." In an age where more money is being spent on producing console game, it's great to see that there is at least one toy company that is still investing heavily to bring us quality board games.